Ask average U.S. taxpayers if they would give money to an organization that is openly racist and anti-Semitic and you would get a resounding "No" in response. And yet that is exactly what has happened for more than 20 years, with the Nation of Islam receiving federal funds to operate within the U.S. prison system. A recent report by the Washington Examiner's Alana Goodman revealed that the Nation had received $364,500 dollars from the Bureau of Prisons (BOP) since 2008 to provide inmates with religious services. The Nation's news outlet, The Final Call, called the Examiner story "a vicious flourish of lies," and said the prison ministry "is a great benefit and blessing to the American Penal System." The Nation's work with the Bureau of Prisons dates back far earlier than 2008. 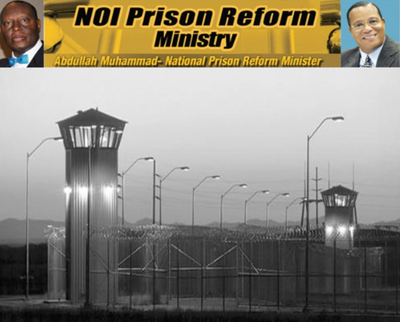 NOI and its officials have been paid to work in prisons since the 1980s. A 1986 Christian Science Monitor article described critics who worried that "Farrakhan's teachings - more about politics than theology - threaten to radicalize prisoners. They blame him for militant indoctrination of black youth who feel abandoned by American society. Farrakhan's is a racist, separatist movement, they say, whose message has particular appeal for a group that feels disenfranchised." This despite the fact that the organization and its leader Louis Farrakhan have a consistent record of anti-Semitism dating back decades. He called Jews "bloodsuckers" just before his 1995 "Million Man March." In just the past year, he has said, "Satanic Jews are my enemy," and compared them to termites. According to BOP regulations cited in a 2004 Inspector General's report on Muslim chaplains, regarding the vetting of contract workers, "...a contractor or volunteer will be dismissed based on any credible evidence that the person has potential ties to any terrorist-affiliated organizations or individuals; advocates racism or violence." What more does the BOP need before determining that the Nation of Islam crossed this line? The Nation also published "The Secret Relationship Between Blacks and Jews," which falsely claims that Jews dominated the slave trade. After a second volume was issued in 2010, the Simon Wiesenthal Center published a 16-page paper refuting its false history. How were proponents of this type of ideology able to gain access to the U.S. prison system? Who in the Department of Justice, the agency responsible for vetting religious clergy and volunteer workers in the Bureau of Prisons, approved the NOI to receive taxpayer dollars? It isn't difficult to imagine what would happen if a prison contracted with a Christian clergyman who disparaged Muslims in any way. The national advocacy groups would immediately demand the cleric's termination and removal of any instructional material provided. Why should such naked bigotry be tolerated in this case? The Bureau of Prisons, citing regulations, gives each facility's Chaplain Services office the authority to contract for religious services that it cannot provide. Federal records show the Nation of Islam has been paid more than $420,000 just since 2005 both for services and for purchases, likely books and recorded materials produced by the Nation. Payments for services can range between $200 and $800. An individual prison could have paid up to $25,000 for the Nation of Islam to perform weekly Jummah services for one year. These services would not include literature which the BOP also purchased from the Nation of Islam. Among the literature the NOI supplied was "The Final Call" which promotes conspiracy theories depicting the Jews as the source of all society's problems. That type of hate speech could easily incite violence, particularly in the prison environment where Jewish inmates are a minority. Somewhere in the Bureau of Prisons central office there should be a list of all the Nation of Islam personnel who did business with the BOP and a security assessment by either the FBI or the National Joint Terrorism Task Force (NJTTF) of any ties to terrorist or racist organizations. U.S. Rep. Vern Buchanan, R-Fla., has issued a statement last Monday asking the Department of Justice to stop future payments to the Nation of Islam. "The federal government should not use taxpayer dollars to subsidize one of the most infamous hate groups in the United States," Buchanan said. Congress should follow up and shut off the spigot that lets taxpayer dollars flow so freely to this hate group. It should also have the DOJ's Inspector General investigate the failure of the Bureau of Prisons to properly vet religious workers and contractors.